Now available on CD as a value-pack option with Individuals, Corporations, and Comprehensive Texts—please contact your Pearson representative for ordering information: This user-friendly tax preparation program includes more than 80 tax forms, schedules, and worksheets. 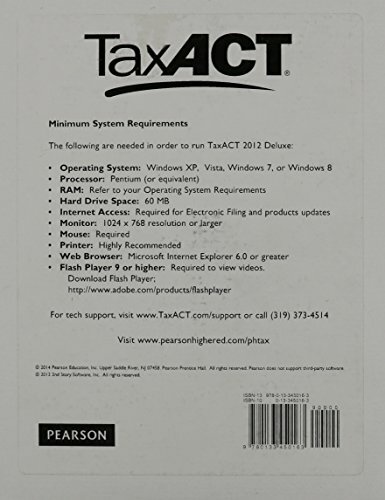 TaxACT calculates returns and alerts the user to possible errors or entries. New to this edition is everything necessary to prepare Small Business and Corporate taxes on forms 1065, 1120 and 1120S.